Artistic, beautiful, and modern, this 14k solid white gold floral design ring is set with a clear, natural, aquamarine gemstone accented on each side by diamonds. Designed with a contemporary and unique flare, the trillion-cut aquamarine gemstone weighs a total of 0.75 Carats and measures 6mm x 6mm in size. 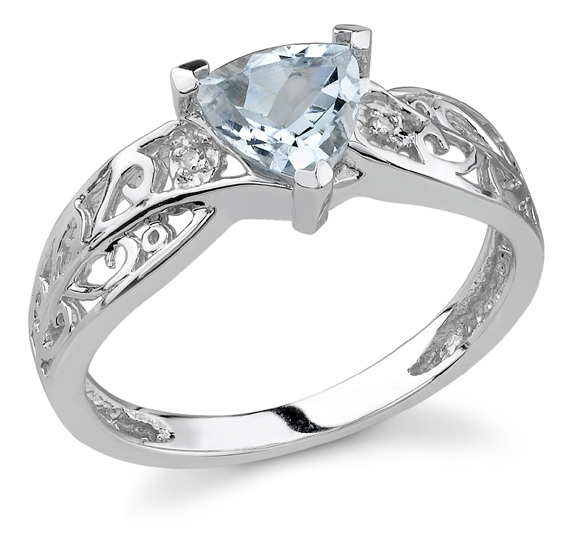 Diamonds weigh a total of 0.01 carats to subtly accent the aquamarine with a touch of light. We guarantee our Trillion Aquamarine Ring with Diamonds in 14K White Gold to be high quality, authentic jewelry, as described above.